Cllr Sarah Hacker: Love real nappies! Real Nappy Week is 16-22 April 2012. I have blogged before about my love of cloth nappies. We are still going strong with cloth bum number two. I can only imagine the £1,000's we have saved using cloth let alone the tonnes of waste saved from landfill. I never have poopy nappies in the bin waiting for collection and, unless I'm not paying attention, I never run out of nappies. I've got plain ones, coloured ones and patterned ones. Bamboo ones, minky ones, all-in-ones and two part nappies and wraps. 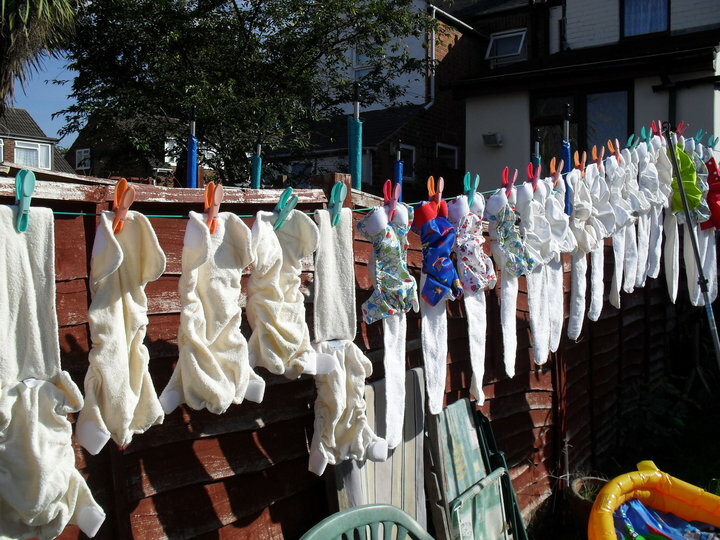 I actually enjoy hanging them on the line and folding them when dry. I will actually be quite upset when littlest potty trains - I reckon I have a year using cloth on him max. There are usually loads of deals during Real Nappy Week so if you are thinking about trying them out, now would be a good time. Also don't forget Reading Borough Council offer £30 cashback on real nappy purchases.